Do we really need singer-songwriters? Can’t we simply ignore them so that they disappear? The world would certainly be a lot more quiet without them — so quiet, though, that you’d be able to turn on your favorite music radio station and hear nothing but dead air interspersed with the occasional talking commercial — and that half-time show at the Superbowl would be as exciting as watching paint dry on a cold winter’s day. 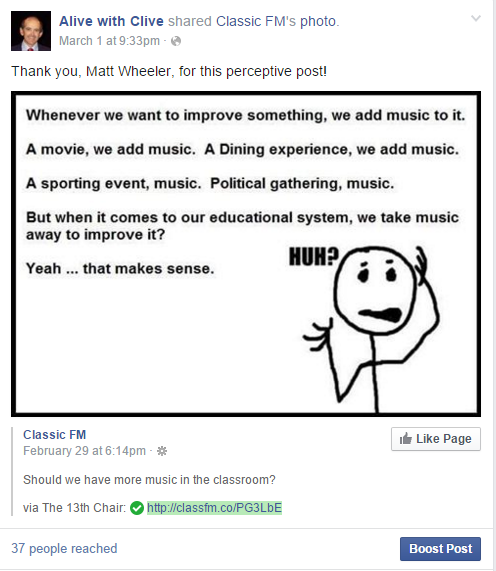 Nevertheless, in some school districts, when budgets get tight it’s deemed acceptable to eliminate music education. So how important is it, really, for us to devote any energy to nurture singer-songwriters so that they can thrive? If it’s acceptable to you to dispense with music education in schools and allow singer-songwriters to disappear like dinosaurs, the content on this Web page is of no interest to you. On the other hand, if you regard the sound of music and great songs, and the self-expression of those who create them for us, as essential and indispensable prerequisites for life on planet Earth, please keep reading. For the past 7 years, Alive with Clive has been shining the spotlight on today’s top emerging and established singer-songwriters. One mission of Alive with Clive is to provide a platform for our top singer-songwriters, who I regard as a national treasure, to be seen, heard, recognized, loved, revered and appreciated. 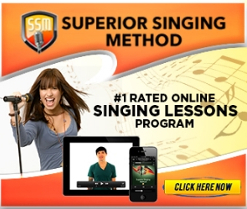 They in turn inspire those with a passion to perform songs to become outstanding singer-songwriters too. Whenever any major tragedy in the world occurs, whenever vast amounts of money are needed to be raised quickly for a worthy cause, whenever a community needs to heal from a major loss, it is the singer-songwriters with their lyrics and melodies who show up to provide their magic and generate the money. And in joyful times, it is the singer-songwriters who invite fans to their gigs so that their fans can be entertained; experience joy; be touched, moved and inspired; get acquainted; network; and develop personal and business friendships for life. As a key voice for today’s top singer-songwriters, Alive with Clive is committed not only to continue to provide the platform it provides for today’s top singer-songwriters, but to kick up what it does for them several notches to a whole new level, so that the singer-songwriters who appear on the show experience a Quantum Leap in their music careers as a result of being on the show. For this mission of Alive with Clive to be accomplished, your support and participation are vital! I have therefore created the Alive with Clive Crowdfunding Campaign of 2016 (“The AWC CFC16”) to obtain your support in a way that gives you value and benefits that far exceed any contribution you make. Through your participation in the Campaign, you will thus also have the opportunity to experience a Quantum Leap in your life, not just in this Leap Year but in every year of your life from now on. For the most benefit from this Crowdfunding Campaign to be realized and enjoyed for all who participate in it, however, it is essential that at least 300 people participate before March 19, 2016 in the manner I’ve outlined below in this Blog post. please keep reading below to see how you too can participate in The Alive with Clive Crowdfunding Campaign of 2016 now. The funds raised in The AWC CFC16 will be used to boost awareness of Alive with Clive in the global marketplace so that the singer-songwriters who are featured on the show become known and appreciated by many more people much faster. create an upward spiral of brilliance and joy in the world! So this is what I have lined up for you in The AWC CFC16 . . .
As mentioned in my previous Blog post, so that you and I can cause 2016 and every year from now on to be a Quantum Leap Year, I’ve summarized the teachings of the world’s most accomplished teachers of the Law of Attraction like Bob Proctor, Mary Morrissey, John Assaraf, Mark Victor Hansen, Jack Canfield, Robert G. Allen, Joe Dispenza, Joe Vitale, and Natalie Ledwell, to name just a few, into easily digestible works and created several resources for you. 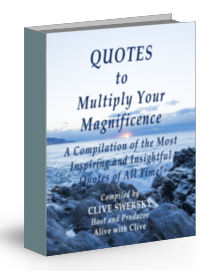 A book of more than 400 of the most inspiring and insightful quotes of all time . 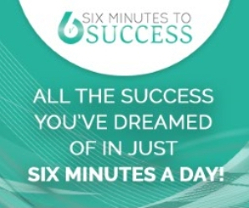 . .
A 7-day course with 7 secrets to achieve any dream you set for yourself . 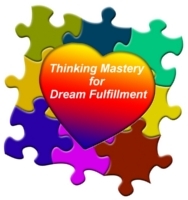 . .
Two interviews on thinking mastery for dream fulfillment . 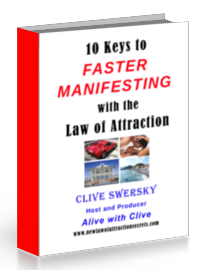 . .
A Special Report on 10 keys to faster manifesting with the law of attraction . . .
All these resources are being made available to you as benefits in The AWC CFC16. When you click here to visit the page for The AWC CFC16, you’ll see that there are different levels and that the more you contribute to the campaign, the more benefits you receive. As part of the launch of this campaign, I’ve created The Alive with Clive Upward Spiral Mastermind Group on Facebook (“The AWC USMG”). As a member of this exclusive Group, you’ll have access on Facebook to me and fellow members who will act as a resource for you and inspire you to experience Quantum Leaps on your path to fulfilling your dreams with the materials, principles and thought processes that are being made available to you as part of The AWC CFC16. In the future, it is going to require a monthly contribution of at least $27 a month, or a large annual contribution of at least $297 a year, to be a member of The AWC USMG. But, because I’m keen to launch The AWC CFC16 like a rocket into the stratosphere, starting right now . . .
1. Everyone who contributes at the $25 Level or higher now will qualify to join and participate in The AWC USMG for a year. 2. If at least 300 people including you contribute to The AWC CFC16 at the $25 Level* or higher BEFORE MARCH 19, 2016, all who contribute at the $25 Level* or higher before March 19, 2016, will be given LIFETIME access to The AWC USMG, and thus won’t have to subscribe at $27 a month or $297 a year (or at some other higher amount), to continue to have access to The AWC USMG after a year. 4. 10 Keys To Faster Manifesting with the Law of Attraction. I will be recording these Webinars and converting them into a digital product I will sell for at least $297. If at least 300 people including you contribute to The AWC CFC16 at the $25 Level* or higher BEFORE MARCH 19, 2016, you will be invited to participate on the four Webinars, LIVE, and receive LIFETIME access to the recordings – FREE! The four Thinking Mastery for Dream Fulfillment Webinars that will sell in a course for at least $297. * To assist you in overcoming procrastination immediately, please note that I could at any time before March 19, 2016, raise the $ contribution Level at which these two LIFETIME bonuses will be made available to above $25. 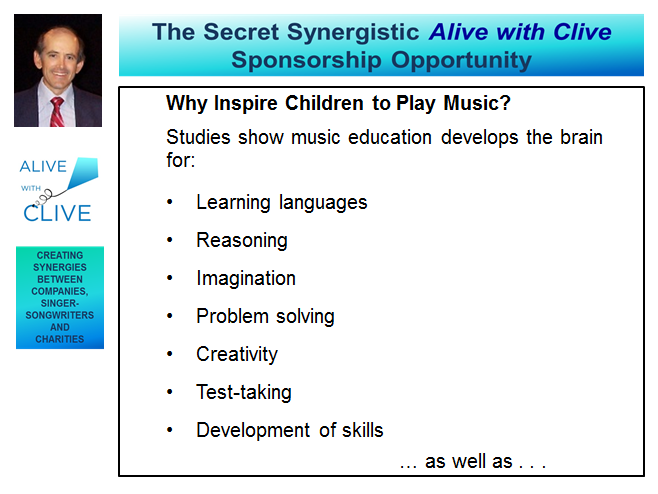 Thus if you know you want to make a contribution to The AWC CFC16 so that singer-songwriters who are featured on Alive with Clive can experience Quantum Leaps in their careers, and be in The AWC USMG so that you too can experience Quantum Leaps in your life every year from now on, click here to make your contribution now. This is what there is for you to do now . . .
– you increase the likelihood that, for a one-time contribution of just $25, you’ll receive LIFETIME ACCESS to The AWC USMG and the four Thinking Mastery for Dream Fulfillment Webinars and recordings that will sell for at least $297. I look forward to seeing your contributions flow into The AWC CFC16, and to interacting with you in The AWC USMG! You’ll receive your invitation to join The AWC USMG soon after you make your contribution at the $25 Level* or higher. 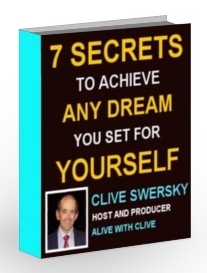 http://alivewithclive.tv — creating an upward spiral of brilliance and joy in the world! P.S. After you visit the Web page for The AWC CFC16, you’ll see that tremendous benefits are available for you if you’d like to contribute at a Level higher than $25. Benefits at the higher Levels above $100 are limited in quantity. With lots of additional traffic to the Web site for Alive with Clive expected in the days, weeks and months ahead, those benefits will prove to be extremely valuable. So if you participate at a higher Level, you’re destined to reap bountiful rewards. To see all the value that is in store for you and participate in The AWC CFC16, click here now.